I have had the PLEASURE to be able to show several horses bred by Rocky Top Appaloosas and EVERY one of them were good legged and GREAT minded! Bill and Jeanette are TRUE horsemen that are honest, fair and ethical. I feel fortunate to call them friends! After having owned, trained, and shown many Cook bred horses over the past 6 years, I would highly recommend their horses to anyone. The Cook’s horses are great minded and are very athletic individuals. 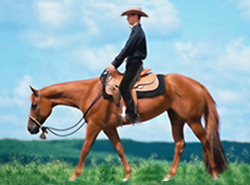 They are the type of horse that beginners can train and anyone can show successfully. We have used many of their horses in our training program at UMC with a perfect success rate. Students learning how to train are pleasantly rewarded with a strong young horse and a willing, trainable attitude. I am ALWAYS willing (and begging) to take a ‘Cook Bred’ horse into our training program! I own two Rocky Top bred appaloosa geldings that will be our ‘forever horses’ because they are multi-disciplined and will take care of anyone; from my own 3 kids to the beginner riding students at UMC, to the advanced riding student that need to know what ‘right’ feels like. Purchasing a horse from the Cooks will be like joining a family. Bill and Jeanette are always thrilled to show you their stock, and then expect to spend the rest of the day having coffee and visiting with them. Truly, the nicest, most honest people you will ever meet. I have known Bill and Jeanette Cook for quite a few years now, and most of the horses in my breeding and showing program are offspring of the Rocky Top Appaloosa bred horses. I have proudly owned several quality horses sired by Zippos Country Cat, or out of a Zippos Country Cat daughter and many of these horses have gone on to compete at Youth World and ApHC breed shows in every performance event. As a beginner in the breeding area of the industry, Bill and Jeanette are who I look up to in every aspect of the breeding business. When people ask about my horses, it is a pleasure to tell them the foundation of my breeding program come from Rocky Top Appaloosas. I purchased my stallion, Zippin Dirty, from Bill and Jeanette. He is a 2005 son of Zippos Country Cat, and I couldn't have asked for a better mover. Zippin Dirty is so versatile, he competes in Western, HUS, Halter, HIH, and in the future he will compete in Western riding. Zippin Dirty has been a world show competitor, and a futurity champion, and he received a ROM in Junior Western Pleasure with only three shows under his belt; these achievements are a tribute to the quality of horses produced at Rocky Top Appaloosas. Zippin Dirty’s first foal crop is heading to the show ring this year and I’m excited and hopeful that they will do well in the tradition of many successful Rocky Top bred horses. When Rocky Top Appaloosa is mentioned, it's only compliments from extremely satisfied clients and most of all - many friends. Bill and Jeanette work hard to see that their customers are happy, and are often seen helping at the shows and enjoying the horses. If I can accomplish half the success Bill and Jeanette have with their wonderful program, I will be happy with my business. Thank you Bill and Jeanette, for all your hard work and dedication - I can't wait to see what is yet to come! Bill & Jeanette always have such amazing horses produced each year! It seems that their stock is always placing in the top four, no matter what discipline. I am very pleased that I am now the proud owner of one of their fillies. She is amazing, great conformation, super attitude, and a joy to work with. I cannot wait to begin showing her this year and showing off her amazing ability. I would recommend their horses to anyone, whether you are just starting out or wanting a horse to to take you to the worlds, their horses are for you.